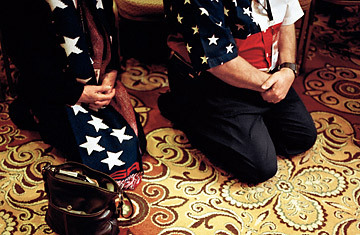 Convention attendees kneel in prayer at the National Tea Party Convention. Does Obama Help or Hurt Dems on the Trail? Can a New Manifesto Woo the Tea Party? If any one person is the founder, it's Rick Santelli. A year ago, the CNBC commentator blew a gasket on the air over a plan by the Obama Administration to tackle the foreclosure crisis. Multibillion-dollar proposals were flying like snowflakes in Washington, and Santelli's rant struck a chord with people who wondered where all the money would come from. "We're thinking of having a Chicago Tea Party," Santelli declared, evoking the 1773 protest in Boston Harbor. A movement was born. Egged on by conservative interest groups and leveraging Barack Obama's digital-networking strategies, grass-roots opponents of the President's agenda have made themselves a major factor in U.S. politics. Naming the Tea Party movement, however, is easier than defining it. Tea Partyism covers a lot of ground and a world of contradictions. It contains Nashville lawyer Judson Phillips, who recently organized the first Tea Party convention at the posh Gaylord Opryland Hotel, charging $549 per ticket and pocketing an undisclosed profit. But the movement also embraces the volunteers who denounced Phillips and his convention as a money-grubbing mistake. The crowd in Nashville cheered as speaker Joseph Farah demanded proof that Obama is a U.S. citizen. "Show us the birth certificate!" Farah cried. But other Tea Partyers were equally delighted when influential blogger Erick Erickson responded to Farah soon afterward by banishing "birthers" from his blog, RedState. "The Tea Party movement is in danger of getting a bad reputation" by courting conspiracists, Erickson wrote. Whether bitter or sweetened, the tea is winning admirers. According to the latest CBS News/New York Times poll, roughly 1 in 5 adult Americans identifies with the Tea Party movement, which scored its first major victory last month when Republican Scott Brown won the Massachusetts Senate seat long held by the late Democrat Ted Kennedy. Brown's promises to bolster U.S. defenses against terrorists and block Obama's health care reforms gave him a blinding Tea Party aura, the glow of which sent fear through the Administration and fried the circuits of Congress. But you can no more trace that aura to a home address than you can pinpoint the rainbow's end. The Tea Party is not a political party, not yet, and maybe never will be. Rejecting the idea--widely held by Democrats--that a government of brainy people can solve thorny problems through complex legislation, the Tea Party finds its strongest spirit among conservative Republicans. Yet a powerful current of "blame both sides" also pulses through the movement. "We're equally disgusted with Republican and Democrat Congressmen," says Lynne Roberts, a volunteer organizer of a Tea Party gathering in Albany, N.Y. Her group is one of hundreds, maybe thousands, animated by Tea Party energy--millions, perhaps, if you count the groups of just one or two people perusing the daily news and muttering, "They've got to be kidding."